Various individuals online have asserted that the picture was a fabrication of the Ukrainian Security Service (SBU). This is unlikely for the following reasons: The photograph was posted only three hours after the MH17 crash, the general location of the white smoke trail is in the same area where the Buk was seen heading toward when last seen in Snizhne, and the weather matches that of July 17 as demonstrated in subsequent photographs that were released. Additionally, the SBU did not share this photograph until two days later, while, in contrast, the 18 July 2014 Luhansk video was released very quickly by the SBU itself. The photograph did not appear on any official Ukrainian channels before it was posted on Twitter, and the earliest posting of the photograph by a Ukrainian official was by Ministry of Internal Affairs official Anton Gerashchenko on Facebook at 7:45 PM (local time). 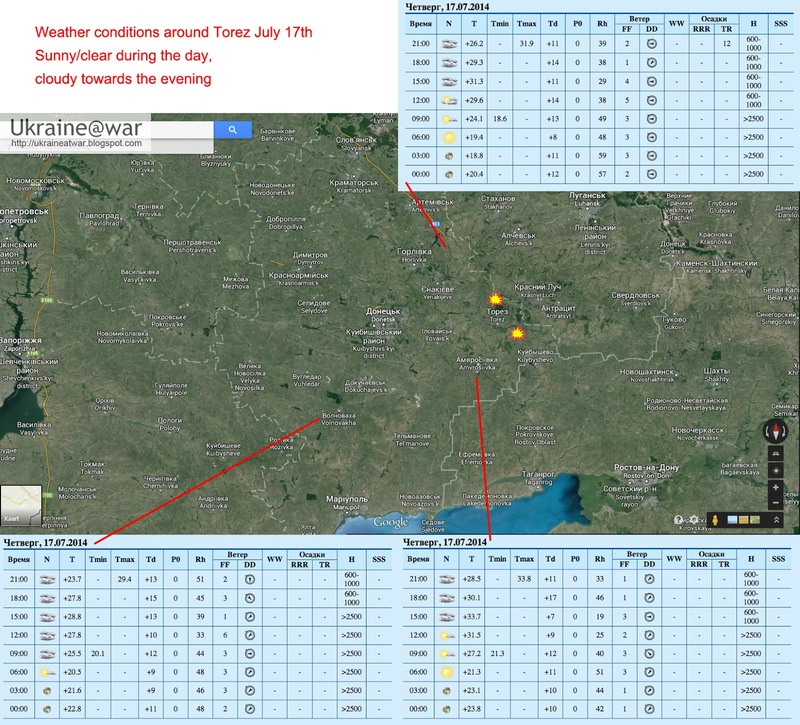 On 21 July 2014, the blogger Ukraine@War geolocated the photograph. The Bellingcat investigation team has verified the geolocation, which indicates that the photograph was taken north of Torez in the direction of a mine in eastern Torez. This detail did not come as a surprise, as the 17 July Twitter post mentioned a ropeway between Lutugina and Tsof in Torez, close to Snizhne. Wikimapia reveals in the area of the mine both Lutugina (‘Шахта им Лутугина’, им stands for имени which means name, so a mine called Lutugina) as Tsof ‘(ЦОФ им. Киселёва’, ЦОФ being the abbreviation of ‘Центральная обогатительная фабрика’ which means enrichment plant, so an enrichment plant called Kiselev). Wikimapia, showing Lutugina (red), the mine Ukraine@war noted (green), and Tsof (blue). Ukraine@War’s work establishes that the houses visible in the foreground of the picture are in the east of Torez, close to the mine. He reaches this conclusion after asking a local resident to recreate the photograph of 17 July 2014, who took pictures from a hill in the direction of the mine. Ukraine@War was able to identify a number of matching features between the two photographs, including a particular pole between the houses and similar types of houses. The Bellingcat investigation team also identified houses under a hill on both photographs. The 17 July 2014 photograph with the same houses marked by a red circle. Panoramio picture taken from a hill toward the east of Torez. 2010 Google Earth satellite image showing the area near a hill in the east of Torez with the long light pole (red circle), two similar houses (blue and green circles), two wooden electricity poles (orange circles), and a rectangular piece of ground (pink rectangle). A part of another recreated photograph taken by a local and published by Ukraine@war showing the hill the Panoramio picture was taken from as well as the houses marked by a blue and green circle. The wooden electricity poles aren’t in the picture here because they have likely been removed. It’s clear that the photograph of 17 July 2014 and the recreated image taken by the local show nearly the same location: an area in eastern Torez, east of a hill, and close to a mine on the edge of Torez, near Snizhne, and photographed in the direction of that mine and Snizhne. Further examination of the photograph when compared with the Google satellite imagery reveals additional matches, especially when the view in Google Earth is turned in the same direction. First image with matches between the 17 July 2014 picture and the Google Earth satellite image. Second image with matches between the 17 July 2014 picture and the Google Earth satellite image. Third image with matches between the 17 July 2014 picture and the Google Earth satellite image. Fourth image with matches between the 17 July 2014 picture and the Google Earth satellite image, which show correspondence between the picture and the trees near the mine at the eastern edge of Torez. Second picture taken on 17 July 2014, north of Torez. Panoramio picture of the hill east of Torez. It’s also worth investigating where the photograph was taken. Many have concluded that the picture must have been taken from a tall building in northern Torez, since a field is visible behind the houses in eastern Torez, and fork-shaped poles near the mine are visible in the distance, which could not be seen from a hill where the local photographed the same area. The Bellingcat investigation team verified this conclusion, and we judge that the assessment that the photograph was taken from a tall building in northern Torez is correct. Approximate location the picture was taken from (red circle), the view frame of the picture (pink lines), the hill visible in the second picture (orange), the eastern part of Torez (green), and the mine with the poles visible on the 17 July 2014 picture (blue) . Contrails or vapor trails of airplanes, arranged from fresh to dispersed. When we look closely at the white smoke trail of the 17 July 2014 pictures, it’s clear that it doesn’t resemble the contrails of airplanes. Plane contrails are quite straight, and even after being dispersed almost entirely, the shape of the contrail stays straighter than the white smoke trail we see in the 17 July 2014 pictures. We have also compared the 17 July 2014 white smoke trail with several pictures and movies of Buk M1 missile smoke trails. When we compare the white smoke trail of the pictures of 17 July 2014, there is much more similarity with the images of the Buk M1 missile smoke trail than with the contrails of airplanes, the main difference being that the white smoke is more dissipated and dispersed by the wind in the 17 July 2014 pictures. Even the cloud of grey smoke characteristic of the first stage of a Buk missile launch (shown on the following images) can be seen in the 17 July 2014 pictures. White smoke trails (and grey clouds near the ground) after a Buk M1 missile launch; images and screenshots from videos found on a Russian website and YouTube. Other type of rockets like Grads or Tornados don’t leave a long white smoke trail in the air, as they are intended for ground targets at distances of 20 to 35 kilometres and cannot be used for air targets. So, it is very possible that the white smoke trail (and the smaller grey smoke trail) we see in the 17 July 2014 pictures was caused by the launch of a surface-to-air missile, like the Buk. Despite the ostensible authenticity of the images, our team sought to verify whether the second picture really was made seven seconds after the first and to show that the first published picture is not just an edited version of the second one. One image appears to be a zoomed in version of the second, so we overlaid the zoomed image on top of the unzoomed image. As seen above, this was a perfect match, with the camera in the unzoomed image auto-focusing on the cables laid over the image in which the camera causes the background to be out of focus. Because the cables were close to the camera position, the zoomed image no longer shows the cables. This is congruent with local weather conditions in Snizhe on July 17th, which show that the wind was blowing from east/east-northeast around the time of launch. Based on the visual information from the pictures and metadata of the original versions of the pictures, it is clear that the white smoke trail has moved because of the wind coming from the east, and it is our conclusion that the pictures are authentic and not fabricated or manipulated. Uncompressed versions of both photographs are available here. The second picture leaves no question regarding the weather on 17 July 2014. In the first picture, an almost completely blue sky is visible, and houses in eastern Torez seem to be in full sunlight, while on every video that has been published about the crash of Flight MH17 the sky is cloudy. The distance between the crash site and this area in Torez is about 15km, and the distance between the area the photograph zooms into and the crash site is about 20km, so it is possible that the weather at the crash site may have been different from the weather where the picture of the white smoke trail was taken (and/or the location from which the Buk M1 missile was fired). There was a lively discussion about the weather in eastern Ukraine on 17 July 2014, but a definitive conclusion is difficult to reach. What these images demonstrate is that Torez would have been on the edge of a cloudy region, so there’s no reason to expect thick cloud in the area. In fact, an earlier photograph taken of the Buk missile launcher inside Torez around midday on 17 July shows a fairly clear sky, which is consistent with the fluctuating weather in the area at the time. After acquiring the original copies of the smoke pictures from the photographer it became apparent that the shutter speed differed between the two photographs, and the photographs that had been previously published had colour and brightness adjusted to make the smoke trails more visible, which also affected the visibility of clouds in the those images. Based on the original images, it is clear that the weather visible in the pictures matches the local weather conditions at the time. More information about how this location relates to other claims and evidence about the launch location of the missile that downed MH17 can be found here. Also, on first image there’s almost no black smoke, whereas on the second there’s more than plenty – how is that possible if you say they are connected? On the original published photographs the color settings were adepted to make the white smoke trail more visible, the result is that the grey smoke is lighter on the first picture and darker on the second. I appreciate your answer on my posting. It’s a foto of the crash-site of MH 17. Could you release the Exif Data (just the exact time) of this third Foto? The 3rd picture has been taken at 16:30:06 according to the metadata. Did the photographer take photo one and two from his balcony or from the rooftop of the building where he lives? You’ve done a big good job! But If it’s true, missile was fired from Torez on the right side of the plane, so keep to logic it should impact also to the right side of the plane. But all photos show that impact was from the left, and moreover, take a careful look at the pictures of upper surface of left wing ending you’ll see several long rips directed to the cockpit. So, in our case missile passed by the plane on speed appr. 1000 m/s. then made U-turn and hit the target from the back-left? Pretty advanced missile for Russia… or, maybe it was launched from some other site? Or maybe it wasn’t BUK? Or m.b. AA? – Easy… Where am I wrong? They come to the conclusion the plane was hit “by a large number of high-energy objects that penetrated the aircraft from outside”, which excludes the option the plane was shot down by a fighter jet. A fighter jet also never would be able to hit the plane at the front side. By the way I didn’t hear an answer to my qwestion about how UPPER SURFACE of the LEFT WING happens to be ripped in direction from end to fuselage when Buk was fired from RIGHT side, look to the map, it’s a miracle, don’t you think? I see a picture, which has a piece of metal that looks identical to the element of air missiles. And a few holes, diamond-shaped and Delta, are the same as leaving the striking element. So what do you have to say about the multiple witnesses accounts that mention an airplane near MH17 ? Are all they lying ? Are they russian agents ? Why do you dismiss the Rostov radar data? I have strong doubts these witnesses speak the truth. As we know the area where MH17 was flying and got shot was very cloudy, so it would be very difficult to spot planes at a height of 10 kilometers when it is cloudy. The SU-25 theory already has been debunked often enough and official investigation already has come to the conclusion the plane was hit by a ground-to-air missile. You claim it was difficult to spot planes. But clearly the BUK platform took a shot without clear radar vision, because – as is the official story from the SBU – ¨a bird is on its way¨. This means some rebel must have detected it by his own eyes. Which scenario is not correct, yours or the SBU´s? What good are the “official reports” when Kiev can exclude any information it wishes from them? The official reports are not written by the Ukrainian government, but by researchers from several countries, among them the Netherlands and Australia. Kiev has no influence on these reports. Good example of russian (pro-Kremlin) liars. You can meet all together – bullets from Su-25 (with magic size from 10mm to 25mm and square instead of round), R-60 missile with shrapnel Sh-361 shell warhead, everything which save Mr.Hitler from judgement. Read, sink in lie, come outdoor and breah fresh air! https://pbs.twimg.com/media/B_B7BvAW4AARb0m.jpg:large All photos – metallic debris and seven different holes, identical lethal force P-60M, made by Dutch journalist. I do not like Putin and worked in opposition media in Russia. I’m just wondering whether this chip in the final report Dutch OV. Nice try, but this is NOT R-60 warhead and splinters. This is Fragmentation artillery shell. Please more lie and Haague come closer and closer. On photo where shell in really is soviet 76.2mm shrapnel (with rod shrapnel) shell Sh-361. 1. It possible only from separatists area. 2. Only historical reconstructors like Strelkov-Girkin can use 76.2mm gun of 1938 year. Ukraine dont have it as armament and dont use it. Again I read through this material…as with other material…to suggest that this was from a Buk missile using photos provided and other sources you have used implies that this was done by anti coup fighters and indirectly the Russian authorities. This analysis appears nice but you need to see it for the propaganda value that you and your paymasters use it for…. 2.You have an anonymous photographer. Will he testify to the inquiry as biased as that inquiry is. 4. If it was a Buk missile or another ground based missile you would have plenty of witnesses. The witnesses would have seen a trail for KMs. Where are they? 5. Eye witnesses did see war planes before and after the incident. Why isnt the West focusing on actual eyewitnesses, many exist. 6. Russian radar data has been made available, showing unidentified aircraft. Where is the Ukrainian data? Or western data for that matter? Which exists but is not presented. 7. The Blackbox data was kept in limbo for weeks something that is unheard of. Blackbox data from a plane crash in Africa two weeks after MH17 was available in days. Sounds fishy to me. 9. Logic would suggest that if it had been a firing from the ground that the plane due to its position and altitude was a civilian plane moving away from Ukrainian territory and onwards to Russian airspace. In fact it was very close to Russian airspace. Anti Government forces would NOT have any political reason to shoot it down. Even If they had the Know how or capability. 10. The plane wreck has not been properly investigated or taken away for investigation. There is a lack of concern by Western governments. Its not in their interest to examine it carefully. Arguments that it is in a warzone don’t wash the crash area itself is away from the fighting. The local authorities are still waiting for investigators. 11. The inquiry by the Dutch into the incident is clouded with secrecy provisions within the agreement made by it and its Western allies as well as the Ukrainians. The Malaysians whose plane was shot down were not part of the investigating group at the start. They have had pressure placed on it. Its hardly going to be independent. A proper International Investigation is required preferably by The UN. The photos you have analysed as stated above are nice but when seen in the context of the whole picture, shows that you and your web page serve to continue the anti-Russian propaganda narrative that has been the purpose of the WESTERN BACKED COUP in the Ukraine. A coup that started by well meaning Ukrainians but was then hijacked and manipulated by Western Intelligence, its aim, to strategically realign politics on the Russian border. Your webpage needs to be seen, like so many on this issue, as partisan. I believe that you are actually funded, trained, backed and supported by Western Intelligence services. I have no doubt that these services read and contribute directly and indirectly to your page for the purposes of disinformation of readers. I think Bellingcat would admit they are partisan. Or do they deny that? We for sure are not partisan, we did research and came to conclusions. These conclusions are as they are and it is important to reveal the truth, despite we realize many people prefer not to know the truth. 1. The Buk came from Russia, together with trained crew. Ukraine had no Buk systems in the area were MH17 was downed, since this area was and still is under control of rebel forces. 2. Eventually the photographer might testify, actually he already did, be it anonymously to protect his safety and privacy. 3. If you read the report good, you can read we have written the smoke trail was photographed a few minutes after launch and the trail was moved by the wind. The Buk videos on youtube show trails after a few seconds. 4. There are several witnesses that have seen a Buk driving in Snizhne, a photograph was taken and a video was filmed. Audio recordings have been published were people mention a white smoke trail (Zello conversations). 5. The area where MH17 was flying was very cloudy, it would be very difficult if not impossible to see fighter jets at a height of 10 kilometers. The SU-25 story already has been debunked several times. 7. The black box first had to be retrieved from the separatists, which wasn’t easy, since they didn’t want to give it to the Netherlands, so they gave it to Malaysia, who sent it to the UK again for research. 8. Aviation dialogue has been published and translated. 9. There was indeed not a political reason to shoot MH17, it was a mistake, they tought it was an Ukrainian military transport plane. Since they only had the Buk missile launcher and no radar and/or control unit, they had no additional information about the plane. 10. Most parts of the plane have been transported to the Netherlands, where it will be almost fully reconstructed. Many parts of the plane already have been examined thoroughly and pieces of metal from a Buk missile have been found in the wreck of the plane. 11. Malaysia does not have the capability to research the plane, they are however for sure involved in the research, just like Australia, Germany and UK, so it for sure is a proper international investigation. It is a pity you believe the Russian propaganda about a western backed coup. Ukrainians themselves chased away Yanukovich, because they had enough of a highly corrupted government and a president who was living in extreme luxury, while Ukrainians had to live in poverty. They chose a new president and it was his decission to send the army to the east of Ukraine, other European countries had no influence on this. And no, we are not funded, trained or supported by whatever intelligence services, although we take this as a compliment as it apparently says something about the quality of our work. We don’t get paid at all, we are volunteers from several countries, we try to be as impartial as possible, but we understand that those who actually are partisan and on the side of Russia are not happy with our investigation results. It is as it is, we can not deny the truth. So why do you ignore some open sources of information? Like the BI article, where mr.Aleynikov was interviewed straight after the crash. And you know what? He did not see the launch of the rocket, he says. Strange, yeah? We don’t ignore open source information, but we are not able to include every detail in our reports. Remember that many people in Torez and Snizhne, which was and still is under separatist control don’t dare to talk about the rocket launch if they have seen it. People that are on the side of the separatists will simply deny they have seen a missile launch. Despite this situation there are already several eye witnesses who have seen the missile and/or heared it, which have been interviewed, some of them in front of a camera. Laughable. It´s there, even if no one saw it. Because they are afraid. Cooking up ad-hoc conspiracy theories to cover for the one big conspiracy: evil wizzard Putin did it. It was very cloudy, except when the right picture of an invented plume was taken. Very elaborate weatherschemes have to come up to fill the hole. They thought it was an Ukranian plane, yeah right. They thought, look, I have a weapon of mass destruction now. I know there are civilians at 10.000 ft because fighter planes sometimes hide behind them. I can see about 4 dots, but I have no clear vision in my BUK TELAR. So now let take a shot and see what happens. Obviously some Ukranian friegther will fall from the sky. And this of course facilitated by Russian generals. You must be out of your mind when you belive this kind of crap! According to the map showing Torez and the angle of view, the picture was made towards South East direction. The plumes are mowing to the right side which is NOT East but South-West. so indeed towards west/southwest direction. Here is a interesting response to some of Bellingcat’s ideas. Tony, look at older comments, I have already responded to this article.